OBJECTIVES: To identify the association of cutaneous adverse drug reactions (CADRs) with use of fixed-dose combinations (FDCs) and to compare the occurrence of preventable CADRs between self-medication and prescribed medication of FDCs. PATIENTS AND METHODS: All cases of suspected CADRs with the use of FDCs were collected, and causality assessment was carried out using the WHO UMC scale. The burden of CADRs on self-medication and prescribed medication was found out. Preventability status was analyzed by Schumock and Thornton Criteria and compared between self-medication and prescribed medication. RESULTS: A total of 74 CADRs were detected; 68.91% were detected with antimicrobial and 31.09% with nonsteroidal anti-inflammatory drug-based FDCs. Fluoroquinolones + nitroimidazole was the most commonly suspected medications. Majority of CADRs (44.59%) were fixed-drug eruptions, which was significantly higher than others (P = 0.002). Analysis of preventability showed that there was a significantly higher occurrence of definitely preventable CADRs in self-medication group (40%) in comparison to prescribed group (6.81%), P = 0.028. CONCLUSIONS: Self-medication with FDCs is quite common and associated with a higher rate of preventable CADRs in comparison to that in prescribed medication. Cutaneous adverse drug reactions (CADRs) are common and may cause 3% of all disability injuries during hospitalization. The spectrum ranges from fixed-drug eruption (FDE), transient maculopapular rash, to Stevens-Johnson syndrome More Details (SJS) and toxic epidermal necrolysis (TEN). Fixed-dose combination (FDC) of two or more active drugs in a single dosage form is used frequently nowadays. As per the studies by Bangalore et al., FDCs decrease the risk of medications noncompliance and should be considered in patients with chronic conditions such as hypertension and diabetes. However, FDCs are twice as riskier as a single drug having many disadvantages. The 19th WHO essential medicine list incorporates 27 FDCs. Similarly, the National List of Essential Medicines of India 2015 had included 24 FDCs and the National Formulary of India 2011 contains 22 FDCs. However, countless FDCs are now available in India and consumed by patients both on prescription and self-medication. There is limited number of studies on risk of self-medication practice. Several benefits have been linked to appropriate self-medication, i.e., increased access to medication and relief for the patient. However, potential risks of self-medication practice include infrequent, but severe adverse reactions. There is a paucity of data regarding CADRs with FDCs, especially with self-medication, and preventability aspect of ADRs with self-medication versus prescribed medication. Hence, the present study was taken up with the following objectives, for example, (1) to analyze the CADRs with various FDCs and (2) to compare the incidence of CADR and their preventability status between self-medication and prescribed medications of FDCs. This study was a prospective, open-level, observational study for collection and analysis of ADRs in a tertiary care teaching hospital. 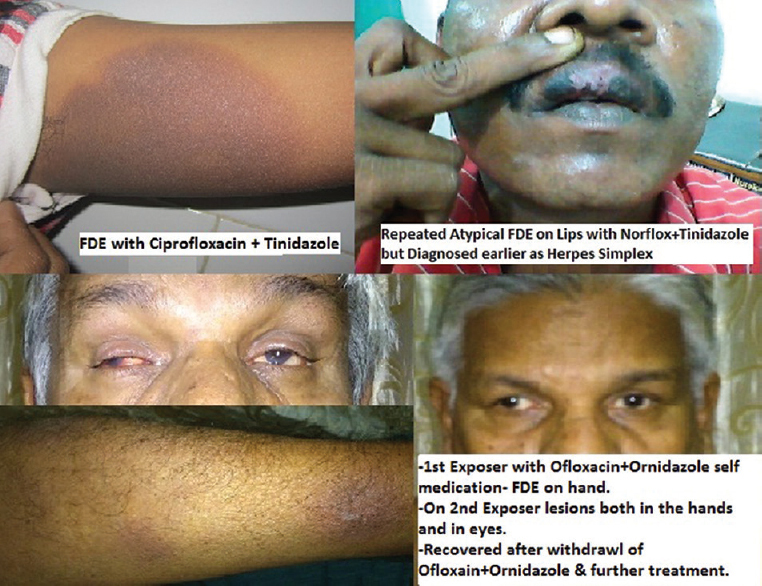 It was conducted in the Department of Pharmacology in collaboration with the Department of Dermatology, Paediatrics, and Medicine and Anti-retroviral Therapy (ART) Centre at SCB Medical College and Hospital, Cuttack, Odisha, over a period of 3 years (from September 2011 to August 2014). Approval from the Institutional Ethics Committee was obtained in the 18th Institutional Ethics Committee (IEC) meeting of SCB Medical College, Cuttack, vide IEC No. 196. All cases of suspected CADRs presented with the use of FDCs in both outpatient and inpatient departments were enrolled. The detailed information of the patients were collected in the suspected ADR reporting forms of Pharmacovigilance Programme of India (PvPI). The causality assessment was carried out using the WHO UMC scale. The severity of these CADRs was assessed by Hartwig scale. The ADRs were also analyzed by modified Schumock and Thornton Criteria to evaluate the status of preventability, especially by applying the Criteria 1, i.e., history of similar drug reaction with the same suspected drug to find out definite preventability. The incidence of different types of CADRs and the suspected FDCs were compared using one-way ANOVA. 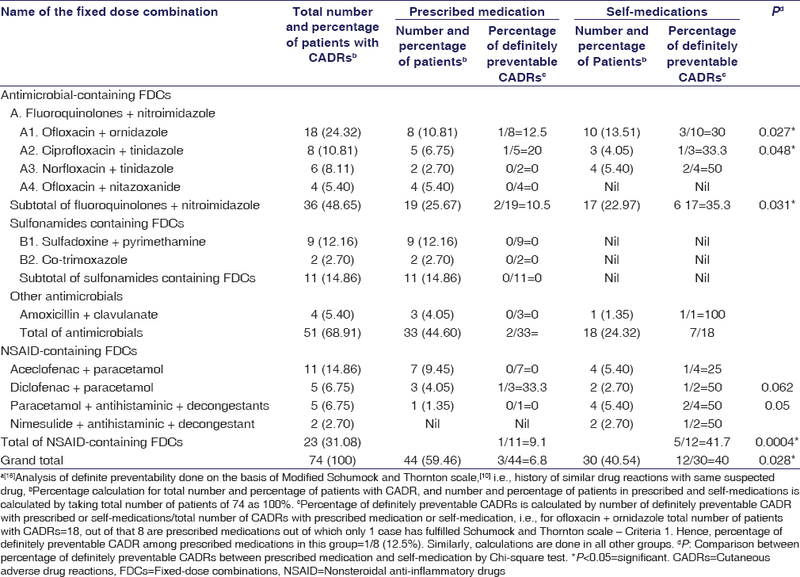 The comparative analysis between percentage of definitely preventable CADRs among prescribed medications and self-medication with each group of FDCs was done by Chi-square test. During this study, a total of 74 CADRs were collected with various FDCs, in which the causality assessment with WHO UMC scale had shown a possible/probable/certain association. In none of the cases, rechallenge was done due to possible ethical issues. In 15 cases (self-medication: 12 and prescribed: 3), accidental rechallenge was positive. The details of CADRs with various FDCs are depicted in [Graph 1]. Majority of the cases were FDEs, i.e., 44.59%, which was significantly higher than other skin reactions (P = 0.002). The details of FDCs involved are presented in [Table 1] and revealed that antimicrobial-based FDCs were the most common and accounted for 68.91% of the reactions followed by nonsteroidal anti-inflammatory drugs (NSAIDS)-based FDCs in 31.09% of cases. 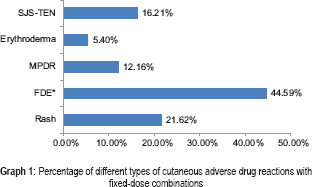 Fluoroquinolone + nitroimidazole-based FDCs were the most common group and were involved in 48.64% cutaneous drug reaction cases. Sulfadoxine + pyrimethamine combination was the most common FDC associated with SJS-TEN in our study. Of the total of 33 FDEs in our study, maximum cases, i.e., 12 of 33 (36.36%) cases, were due to ofloxacin + ornidazole combinations. Severity assessment of CADRs with FDCs, done by applying Hartwig severity scale, revealed that in 23 (31.08%) cases, these cutaneous reactions, i.e., SJS/TEN, Maculo Papular Drug Rash, and erythroderma were severe (Level-5). In 12 (16.21%) cases, the reactions were moderate (Level-3), and in rest of the cases, i.e., 39 (52.70%), the reactions were mild (Level-2) in severity. It is evident from [Graph 1] that the most commonly severe reaction was SJS/TEN. The detailed analysis of CADRs with prescribed and self-medication of FDC and their comparative preventability aspect are depicted in [Table 1]. Of total 74 CADRs reported in our study, as high as 30 (40.5%) of cases were associated with self-medication of FDCs and rest 44 (59.5%) were due to prescribed FDCs. Even with some FDCs, i.e., ofloxacin + ornidazole, paracetamol + antihistaminic + nasal decongestants, and nimesulide + antihistaminic + nasal decongestants, higher incidence was found with self-medication than with prescribed medications. Comparative analysis of preventability by applying Schumock and Thornton scale revealed that there was a significantly higher incidence of definitely preventable CADRs among reported cases of self-medication, i.e., 40% (12 out of 30), in comparison to prescribed medications, i.e., 6.8% (3 out of 44), P = 0.028. Even in various individual FDCs, the incidence of definitely preventable CADRs was significantly higher among the reported cases of self-medication in comparison to that among the reported cases of prescribed medications, i.e., ofloxacin + ornidazole – 30% versus 12.5% (P = 0.027) total fluoroquinolone + nitroimidazole FDCs – 35.3% versus10.5% (P = 0.03) and NSAID-based FDCs – 41.7% versus 9.1% (P = 0.004). This clearly indicates that definitely, preventable CADRs were significantly higher among the reported cases of self-medication in comparison to that among the reported cases of prescribed medications. Use of FDCs is a real challenge, and the Indian medicine market has become the world leader for FDCs with an estimated number of over 6000 FDCs in India. Similarly, self-medication practice is a critical issue. General policy issues of the WHO Drug Information 2000, regarding the benefits and risks of self-medication, have concluded that self-medication can facilitate access to medicines and reduce healthcare costs, but more specific studies needed to evaluate the impact and role of self-medication in the diversity of different healthcare sectors. On this background, the present study has focused on CADRs with FDCs andfound out the incidences of self medications and prescribed medications. This study has shown a high incidence of CADRs with use of FDCs. Majority of our cases were FDEs. The most common FDC implicated was antimicrobial-based FDCs, particularly fluoroquinolones + nitroimidazoles combinations (42%) among which ofloxacin + ornidazole combinations were most common (25%). The next group to cause CADRs were NSAID-based FDCs (31%), of which aceclofenac and paracetamol-based FDCs were common (14.9%). Our study findings nearly corroborated with the study of Radhika et al., in which they have shown FDE as the most common CADR and antimicrobial-based FDCs as the highest numbers. However, our study has also focused on subgroup of antimicrobials and showed the clinical significance of fluoroquinolones + nitroimidazole FDCs as the highest suspected FDCs in CADRs. In contrast to study by Shah et al. on overall CADRs, they have shown co-trimoxazole as the most common FDC followed by fluoroquinolones among the antimicrobials, which was again the most commonly suspected drug in their study. In our study, among the sulfonamide-based FDCs, sulfadoxine + pyrimethamine combinations in contrast to co-trimoxazole were the most commonly suspected drug and was the main cause behind the serious reaction, i.e., SJS-TEN. There are limited data on CADRs with prescribed versus self-medications. A study in 2013 in France has documented that of the total 2731 patients presenting to Emergency Department, 296 had ADRs of which 52 (17.96%) were due to self-medication and 244 (82.43%) were with prescribed medication. Analysis of frequency of self-medication in the FDC-associated CADRs in our study revealed that as high as 40.5% of the CADRs in our study were associated with self-medication and rest 59.46% with prescribed medications. In some instances, i.e., ofloxacin + ornidazole, paracetamol + antihistaminic + decongestant-containing FDCs, the incidence of self-medicated CADRs is even higher than that with prescribed medications. This signifies the higher incidence of ADRs associated with self-medication in our setups in comparison to lower incidence of ADRs with self-medication in western literature. This might be due to responsible self-medication and regulatory permission of comparatively safer drugs for self-medication in their setup. They have also shown that the ADR severity was significantly lower for those related to self-medication. In our study, we also observed that majority, i.e., 60%, of severe reactions were SJS and TEN and. 66.6% (8 out of 12) of them were due to sulfonamide-containing FDCs [Table 1]. However, none of the sulfonamide-containing FDCs was taken as self-medication. This is possibly due to awareness of medicine shopkeepers and the common human regarding serious ADR potentials with sulfadoxine-pyrimethamine and co-trimoxazole. There is lack of literature regarding preventability aspect of CADRs between self-medication and prescribed medications. However, the present study has clearly revealed that there was a significantly higher incidence of definitely preventable CADRs among reported cases of self-medication, i.e., 40% in comparison to that with prescribed medications, i.e., 6.8%, P = 0.028 [Table 1]. This indicates that among the CADR cases in self-medication group, 40% patients had a history of similar CADRs with the same FDC, but such recurrent CADRs have occurred only in 6.8% of patients in prescribed FDCs. Few examples of recurrent CADRs with self-medicated FDCs which would have been definitely preventable are provided in photographs [Figure 1]. Interview with these patients revealed that when the first time they had the manifestations after taking the suspected drugs neither the patient nor the medicine retailer could guess that the manifestations are due to drugs and they suffered for second to third time with same self-medication. After consultation with the doctors, the cutaneous manifestations were diagnosed properly as drug reactions rather than due to disease. However, as those drugs were FDCs, it was again difficult to find out which components were responsible; hence, they were advised to avoid the FDCs and the individual components. Recently, on March 10, 2016, the Drug Regulatory Authority, MoH and FW, has prohibited 344 FDCs under section 26A of the Drugs and Cosmetic Act 1940. The present finding of higher incidence of definitely preventable ADRs among self-medication of FDCs in comparison to that among prescribed medication may strengthen the hands of regulatory authority for discouraging self-medications, especially of FDC. The limitation of our study is that we have analyzed the data from among the cases of CADRs that have presented to the hospital/to the investigating doctors. However, a community-based prospective study may further explore the real burden of self-medication and related injuries, especially with FDCs and other medications. The present study demonstrated that CADRs with FDCs are quite common. FDE is most common among these ADRs. Antimicrobial-based FDCs especially (fluoroquinolones + nitroimidazole) FDCs are the most commonly suspected agents followed by NSAID-based FDCs. As high as 40% of these FDC-associated CADRs are due to self-medication which is markedly higher than that found in western literature. This study conclusively showed that the incidence of definite preventability was significantly higher among CADRs with self-medication than that with prescribed medications. Hence, FDCs should be judiciously used, and self-medication with FDCs must be discouraged. We are thankful to PvPI and Indian Pharmacopoeia Commission, Government of India, for providing technical, logistics, and workforce support for ADR monitoring and enabling us for doing such work. We are also grateful to faculties, postgraduate students, and staffs, Department of Dermatology, ART Center, Medicine, and Pediatrics, SCB Medical College, Cuttack, and also to the patients from whom we have got all the information for this article. Roujeau JC, Stern RS. Severe adverse cutaneous reactions to drugs. N Engl J Med 1994;331:1272-85. Sharma VK, Sethuraman G, Kumar B. Cutaneous adverse drug reactions: Clinical pattern and causative agents – A 6 year series from Chandigarh, India. J Postgrad Med 2001;47:95-9. Gautam CS, Saha L. Fixed dose drug combinations (FDCs): Rational or irrational: A view point. Br J Clin Pharmacol 2008;65:795-6. Gupta YK, Ramachandran SS. Fixed dose drug combinations: Issues and challenges in India. Indian J Pharmacol 2016;48:347-9. Ruiz ME. Risks of self-medication practices. Curr Drug Saf 2010;5:315-23. ADR Form: Suspected Adverse Drug Reaction Reporting Form, Indian Pharmacopoeia Commission, National Coordinating Centre, PvPI, Government of India. Available from: http://www.ipc.nic.in. [Last accessed on 2016 Jul 20]. WHO-UMC Causality Assessment Scale. Available from: http://who-umc.org/Graphics/24734.pdf. [Last accessed on 2016 Jul 20]. Hart Wig Scale; 2015. Available from: http://www.ijrpc.com/files/00050.pdf. [Last accessed 2015 Nov 07]. Raut AL, Patel P, Patel C, Pawar A. Preventability, predictability and seriousness of adverse drug reactions amongst medicine inpatients in a teaching hospital: A prospective observational study. Int J Pharma Chem Sci 2012;1:1293-9. The benefits & risks of self-medication, general policy issues. WHO Drug Inf 2000:14:1-2. Available from http://apps.who.int/medicinedocs/en/d/Jh1462e/1.html. [Last accessed on 2018 Aug 06]. Radhika MS, Mayur SS, Priyadarshini KO. Pattern of cutaneous adverse drug reactions due to the use of fixed dose drug combinations. Int J Basic Clin Pharmacol 2013;2:554-8. Shah SP, Desai MK, Dikshit RK. Analysis of cutaneous adverse drug reactions at a tertiary care hospital – A prospective study. Trop J Pharma Res 2011;10:517-22. Asseray N, Ballereau F, Trombert-Paviot B, Bouget J, Foucher N, Renaud B, et al. Frequency and severity of adverse drug reactions due to self-medication: A cross-sectional multicentre survey in emergency departments. Drug Saf 2013;36:1159-68. The Gazette of India Extraordinary. Part 2. Department of Health & Family Welfare, Notification. Sec. 3, Subsection (ii); 10 March 2016. S. O. 705 (E) - S. O. 1048 (E) Available from http://www.cdsco.nic.in/writereaddata/GSR705E.pdf. [Last Accessed on 2016 Apr 06]. Schumock GT, Thornton JP. Focusing on the Preventability of Adverse Drug Reactions. Hosp Pharm. 1992;27:538.